When Chan Chan was young her parents both died from tuberculosis which is how she came to our Yangon orphanage. Two years later we let her get a test and she was found to be positive with tuberculosis too. After taking medicine for six months, by God’s grace, her tuberculosis was completely healed. Had it not been, she might not have survived. While she lived at Yangon orphanage, she was a good kid. After she finished high school, Chan Chan left Yangon and lived with her elder sister at Myitkyina. Chan Chan recently graduated from Mandalay University with a Bachelor’s degree in economics. 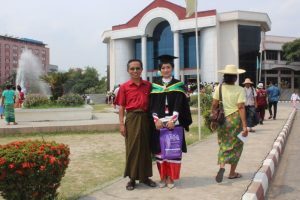 We are very proud of her and traveled to Mandalay to attend her graduation ceremony. She might come to visit us soon. At the present time she is a school. teacher at an elementary school and she said that she needs to attend school teachers seminar at Myitkyina this month.